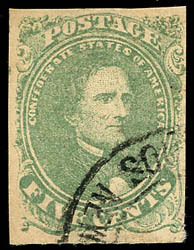 Confederacy, 1861, 5¢ dull green, Stone 1, mostly large margins, cancelled by partial strike of New Orleans Southern Express Co. double-circle; light toning, Very Fine. Scott No. 1; $550 Estimate $300 - 400. 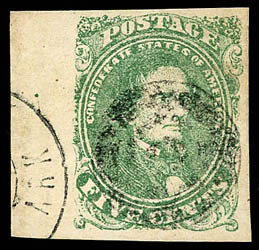 Confederacy, 1861, 5¢ green, Stone 1, large margins including huge left sheet margin, bright color, cancelled by four-ring target and part of Arkansas town cds, light diagonal crease, fresh and Extremely Fine appearance. 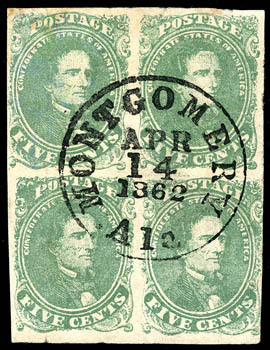 Confederacy, 1861, 5¢ green, Stone 1, block of four, mostly large margins except slightly in at bottom right, bright fresh color, cancelled by bold "Montgomery, Ala. Apr 14, 1862" cds, light vertical creases, Very Fine appearance. A WONDERFUL RARE USED BLOCK OF THE 5¢ GREEN LITHOGRAPH ISSUE. Confederacy, 1861, 5¢ green, Stone 1, position 26, large margins to just in incl. 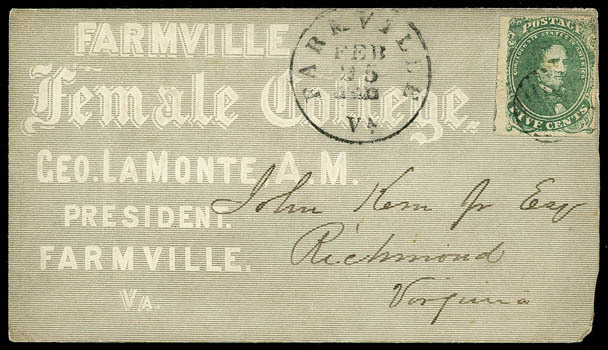 part of adjoining stamp at left, tied by circular grid cancel, matching "Farmville Va. Feb 25" cds on Farmville Female College cover to Richmond Va., Orr & Co. of New York imprint, reduced slightly at right, Very Fine and attractive. Confederacy, 1861, 5¢ green, Stone 1, vertical pair, positions 37/47, tied by two strikes of "Richmond Va., Oct 19, 1861" cds on yellow cover to Mobile Ala.; top edge mend, Very Fine appearance; with 1993 C.S.A. certificate. THE EARLIEST RECORDED USE OF THE 5¢ GREEN LITHOGRAPH ISSUE. The New Postage Stamp: A very large number of the new Confederate postage stamps were disposed of yesterday at the Richmond post-office. Their introduction supplies a want which has heretofore seriously taxed the public endurance. The stamps are of the size of those in use by the United States Government, are colored green and ornamented with a very excellent bust of President Davis. As written in the Richmond Daily Dispatch, Oct. 17, 1861. 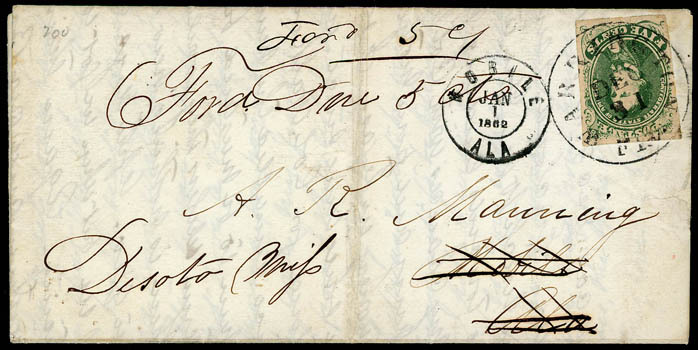 Confederacy, 1861, 5¢ green, Stone I, position 50, four large margins including huge right sheet margin, tied by light "Savannah Ga., Paid, 1862" cds on fresh cover addressed to Genl. 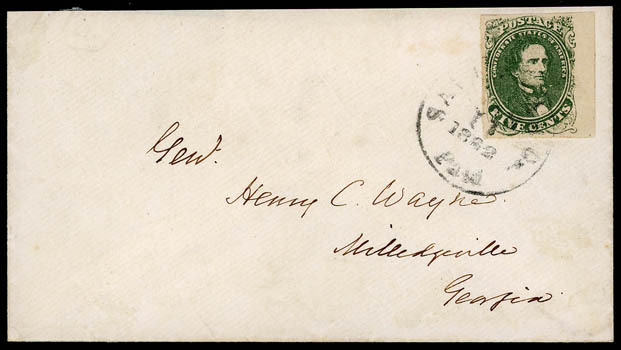 Henry C. Wayne at Milledgeville Ga.; small part of back flap missing, Extremely Fine and choice, ex-Caspary. A GEM USE OF THE 5¢ GREEN LITHOGRAPH ISSUE FROM STONE 1. Confederacy, 1861, 5¢ green, Stone 1, position 6, large margins to in at top, used in combination with 5¢ blue (7), four margins, light crease, tied by near "Winchester Val., Nov 18" cds on neat rose cover to Harrisonburg Va., Very Fine and attractive combination, Pictured in Monroe Book on page 73, ex-Judd. 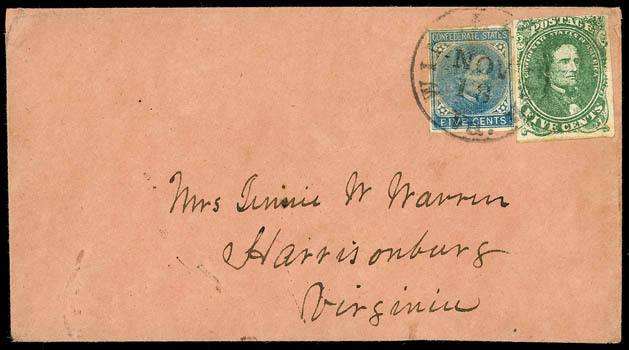 There were very infrequent occasions when Confederate Post Office patrons used a combination of two or more different general issue stamps to prepay the required postage rate for an envelope. They sometimes did so just to use up an older stamp that they owned or, more likely, the local Post Office ran short of certain stamps and asked their patrons to use a combination of general issue stamps that it currently had on hand. Confederacy, 1861, 5¢ green, Stone 1, position 48, four large margins, rich color with clear impression, tied by blue circular grid cancel and matching "University of Virginia, Va. Oct 28" cds on cover to Markham Station Va.; reduced slightly at right, Very Fine College use; signed Kaufman and Bartels. 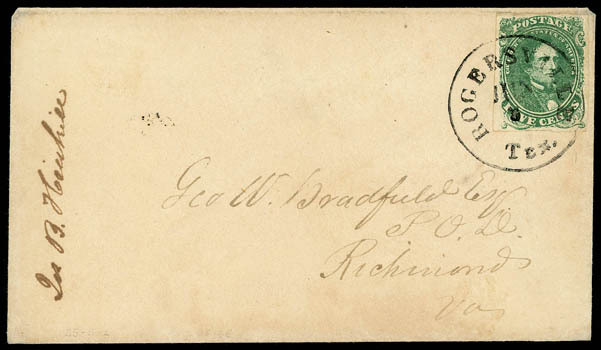 Confederacy, 1861, 5¢ green, Stone 1, four margins, tied by neat "Rogersville, Ten., Jun 3" cds on cover to Richmond, Va., Very Fine and choice, a very scarce usage from Rogersville, ex-McBride, John R. Hill Jr., Haas. Much of Tennessee came under Union control during 1862 and remained so for the duration of the war. Rogersville is located in eastern Tennessee, where Confederate forces were able to resist Union advances more effectively. 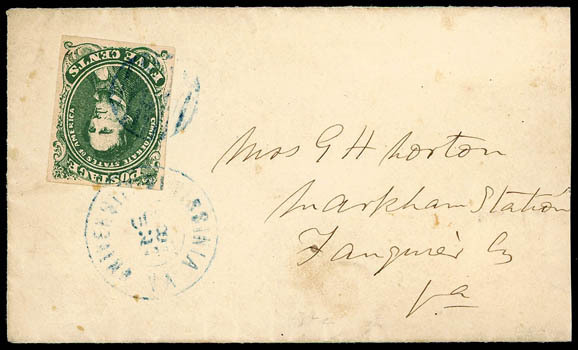 Confederacy, 1861, 5¢ green, Stone 1, large margins all around, tied by "Warrington Fla., Dec 31" cds on folded letter to A.R. Manning at Mobile Ala., forwarded to Desoto Miss. 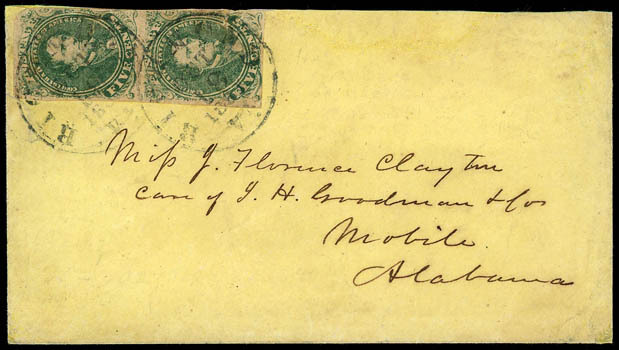 with "Mobile Ala, Jan 1, 1862" double-circle datestamp and manuscript "Ford Due 5 cts" rating; central file fold and tiny nick at right, a Very Fine forwarded use.